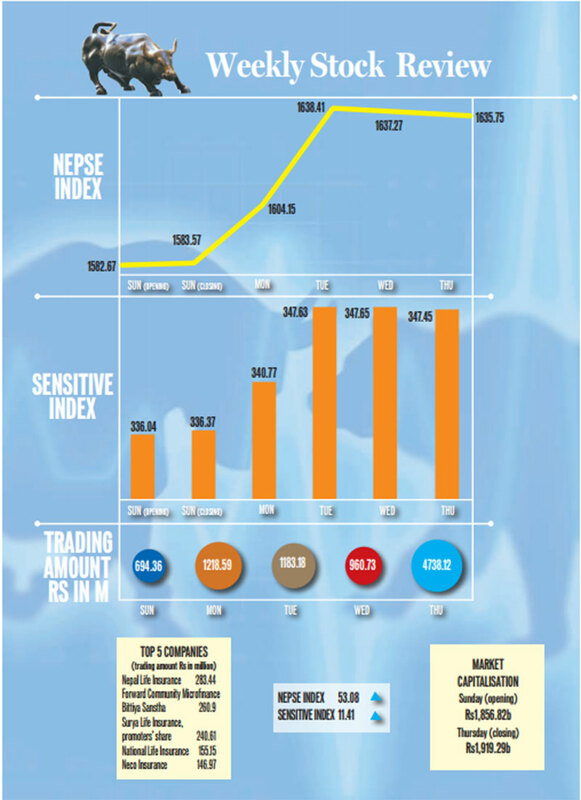 Nepal Stock Exchange (Nepse) gained 53.08 points to close at 1,635.75 points last week, as investors ushered in the new fiscal year with a clean start by paying their loan installments. In addition, the stock market was also influenced by a new provision set forth by the regulator regarding share allotment process of initial public offerings (IPOs). The secondary market that opened at 1,582.67 points on Sunday increased marginally by 0.9 points to close at 1,583.57 points. On Monday, the market jumped up 20.58 points to close at 1,604.15 points. On Tuesday too, the market posted double digit gains, up 34.26 points before sliding by 1.14 points and 1.52 points respectively on Wednesday and Thursday. Ram Chandra Bhattarai, managing director of Aryatara Investment and Securities, said the market was buoyed by an increase in investment induced with the beginning of the new fiscal year. “As most of the investors who took bank loans to invest in the stocks market paid the installment to the banks at the end of the previous fiscal year, they felt free to increase their investment in the secondary market,” Bhattarai said. He also highlighted that the new provision enforced by Securities Board of Nepal could have played a part in the rise in market investment. The new provision makes it mandatory for investors looking to apply for IPOs get a minimum number of shares. “Due to that provision, investors are unwilling to invest huge amounts of money in IPOs and are choosing to invest in the secondary market instead,” said Bhattarai. The sensitive index that measures the performance of Group ‘A’ companies also rose 11.41 points to close at 347.45 points with a significant rise in indices of most of the trading groups including. With the notable rise in market index, the average value of the shares listed on the stock market also went up Rs62.47 billion, with market capitalisation reaching Rs1,919.29 billion from Rs1,856.82 billion over the week. Except for the sub-indices of ‘others’ and trading, the remaining seven trading groups posted a gain in their indices. Insurance posted the largest gains, up 642.82 points to close at 8993.11 points. Bhattarai said a number of insurers including Neco Insurance and Everest Insurance coming up with good returns in their shares had lured the investors towards the segment. The trading group ‘Others’ was the only one to post a loss, dropping 3.76 points. The index of trading was stable at 212.76 points throughout the week. Four out of five companies with largest transaction were insurance companies. Nepal Life Insurance observed the largest turnover of shares worth Rs283.44 million. According to Bhattarai, the insurer’s bonus shares were listed on the secondary market, leading to a surge in demand. Similarly, Forward Community Microfinance Bittiya Sanstha, promoters’ shares of Surya Life Insurance, National Life Insurance and Neco Insurance were also among the top five with largest turnover. Likewise, Laxmi Value Fund 1, saw the highest number of transactions, with 718,000 units of shares exchanging hands. Last week, shares of 165 listed companies were traded. The transaction amount soared 12.72 percent to Rs4.73 billion. The traded number of shares however declined to 8,753,880 units from 11,438,390 units.